• Be inspired to take initiative on some form of social, civic, or political action that addresses a problem in their neighborhood or the broader community through a special series of design thinking/problem solving activities created by our consultant, Chanel Beebe. 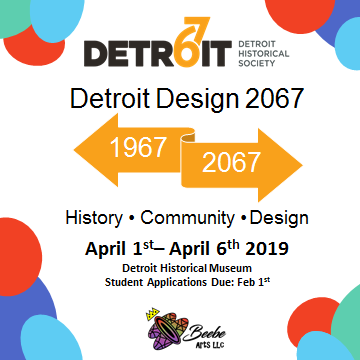 The 2019 session of Detroit Design 2067 will take place from April 1 – April 6, 2019 at the Detroit Historical Museum with a student orientation on March 30, 2019. Completed applications must be submitted by 5:00 pm on February 1, 2019.